Airy and breezy, this tee makes the most of gradient yarn and features fluttery lace accents. 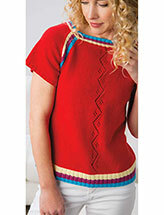 This e-pattern was originally published in the 2018 issue of Creative Knitting's Simple Knits for Spring & Summer magazine. Size: Woman's S (M, L, XL, 2XL). Made with the Fiber Seed Sprout Sock.